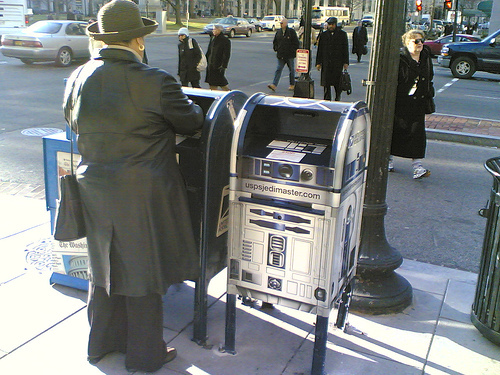 R2-D2 Mailbox Spotted In The Wild | OhGizmo! A few days ago, we brought you news of the R2-D2 themed mailboxes the US Postal Service was getting ready to launch in celebration of the 30th anniversary of Star Wars. Well, they’re out, and despite our speculations that they’d be confined inside post offices for fear of theft, pictures sent to us show otherwise. We imagine it’s just a matter of time until we start hearing stories about missing boxes, and missing mail, and just general hilarity. And I’m too tired to think of an appropriate Star Wars Jedi, Obi Wan and such joke. So, insert one yourselves. Follow the link for a full Flickr set.